Making an anime movie is a big undertaking, but there are few better ways to display your creativity. Animes fall under many different genres, all of which have varying art styles and stories. 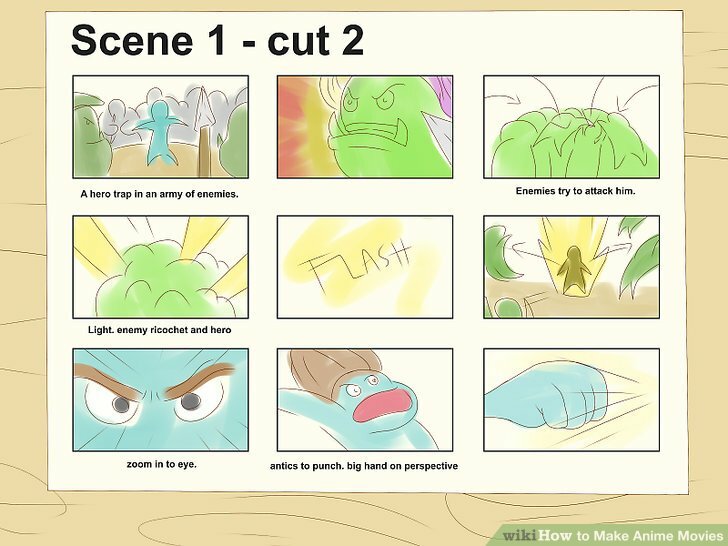 After you draft up your movie’s features, you will need to draw scenes, animate characters, and add sounds. Combine all of your work into a seamless movie you can share with the world. Select a genre for your film. Animation comes in a variety of flavors. Perhaps you want your movie to be a Shonen action romp with colorful superheroes. Maybe you would rather have a cute, subdued slice of life comedy. The genre you choose informs your decisions on the movie’s plot and graphic style. Take plenty of time to think about the purpose of your movie. Some genres are more suited to ideas than others. Drama requires a lot of deep emotions from your characters, but a comedy anime needs jokes and clever dialogue. If you aren’t familiar with genres, search online for descriptions of genres and popular animes that fit them. Watch the recommendations to get ideas on what makes them successful. Starting with genres you are familiar can help, but don’t feel limited if you want to try something new. Combining genres is possible. A show like Psycho-Pass combines police drama, psychology, and cyberpunk elements. Stay flexible. If you discover a different genre is more true to your goals, adjust your film to fit it. Pick a conflict for your characters to experience. Let your imagination run wild to find difficult scenarios to put your characters in. You could go global and write about characters saving the world from evil, or you could go smaller and portray characters overcoming life challenges. There are many problems you can set up for your characters, so select something interesting that fits your genre. For instance, a lot of action animes like Naruto pit characters against dangerous opponents. On the other hand, a drama like Clannad may focus on interpersonal relationships. Pick a graphical style that matches your movie’s tone and conflict. 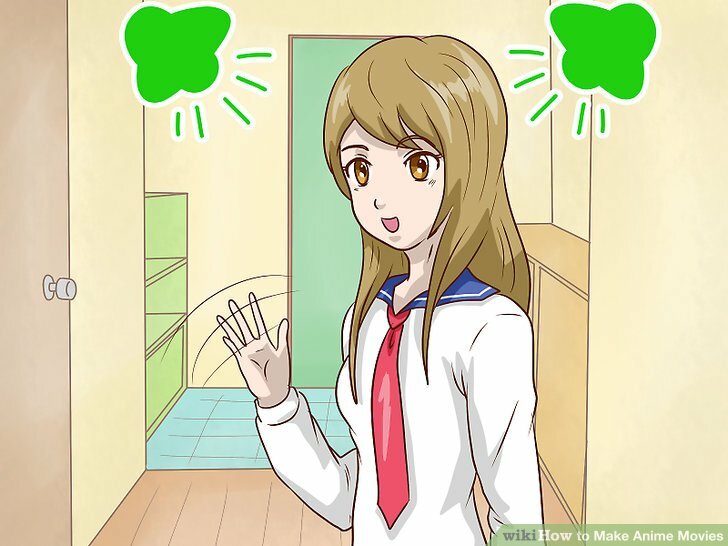 Every anime has its own unique graphical style, which is determined by the artist’s vision and what tools they have available. 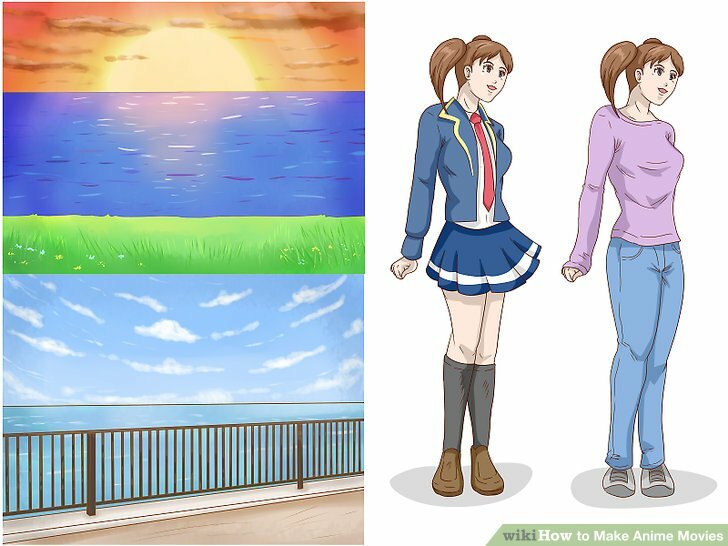 Style is a big part of anime and is reflected in character designs and backgrounds. The atmosphere of your movie can change depending on how bright the colors are or how realistic the characters look. For instance, you may prefer your comedy movie to look surreal by giving characters exaggerated features like in Pop Team Epic. A more serious anime like The Ancient Magus Bride benefits from more elaborate, detailed characters. Studio Ghibli movies, for example, are often very soft and colorful. The characters don’t have complicated designs or tons of small details, making them feel welcoming to audiences of all ages. For example, horror movies are often dark and gritty. 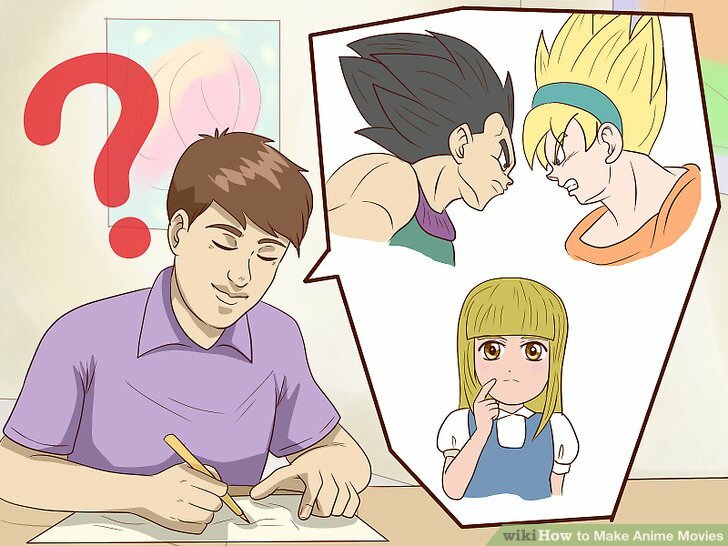 You may choose to draw realistic characters with sharp lines. 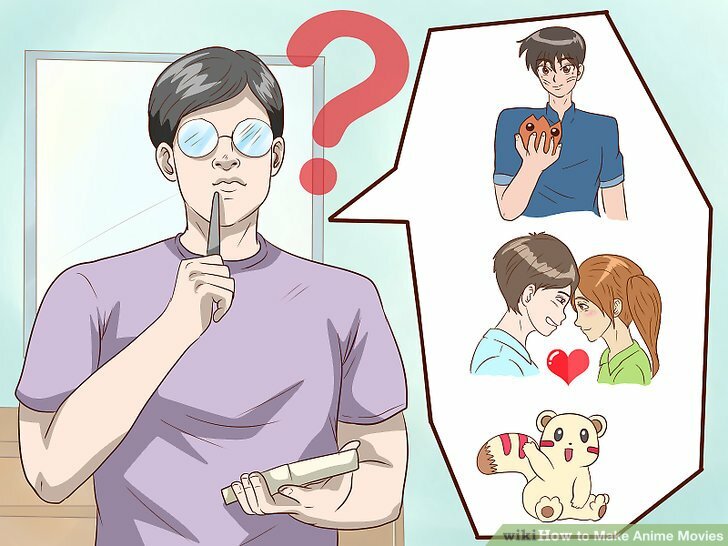 For a light romance or comedy, you might draw very cute characters with soft colors. The background graphics are almost as important as the character design. A dark city with a lot of neon lights, for example, can feel both futuristic and oppressive. Create the main characters and their development arc. Your main characters change throughout their story through their involvement in the central conflict. Once you have their graphical design, decide what they are like before and after the events of the movie. Go into as much detail as possible, coming up with ideas such as what each character likes and dislikes, their strengths and weaknesses, and how they react to problems. Outlining your character’s personality can help you make them feel more real as you write them into the script. If a secondary character seems to have an interesting story, explore it! It could become a great part of your movie. For a simple idea of character development, think of an anime like Naruto where the main character starts out as a bratty kid but becomes successful through struggles and perseverance. Write out the story’s script. 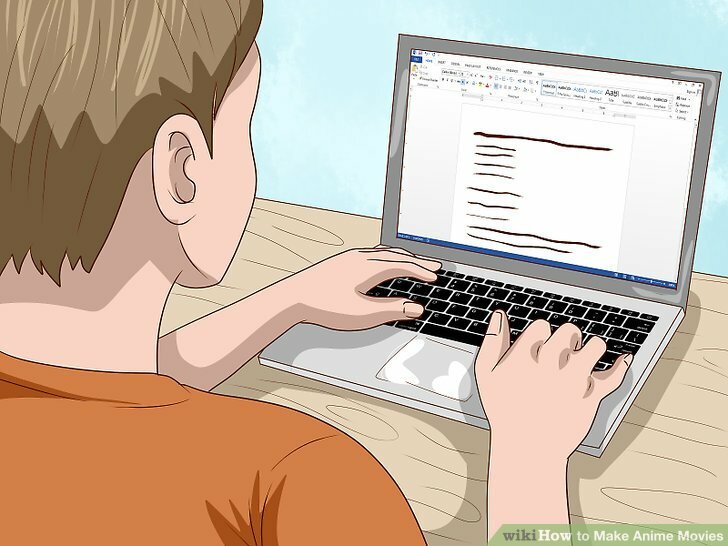 Get a thick pad of paper or open a word processor document on your computer. Plot out your movie scene by scene. This includes character dialogue and actions you want your characters to take as well as the overarching story. When you’re finished, go back and read the script. Edit weak spots and errors to make the script flow better. Do this multiple times until you are happy with your work. Draw your characters to solidify their designs. Sketch a basic design for every character you plan on using in the movie. You can do this with pencil and paper or in an art program on the computer. Your designs don’t have to be perfect, but make them as detailed as you can so you know exactly who you are putting in your movie. Characters can also include animals and objects. If they play a role in your movie, you may want to sketch them out to perfect them. 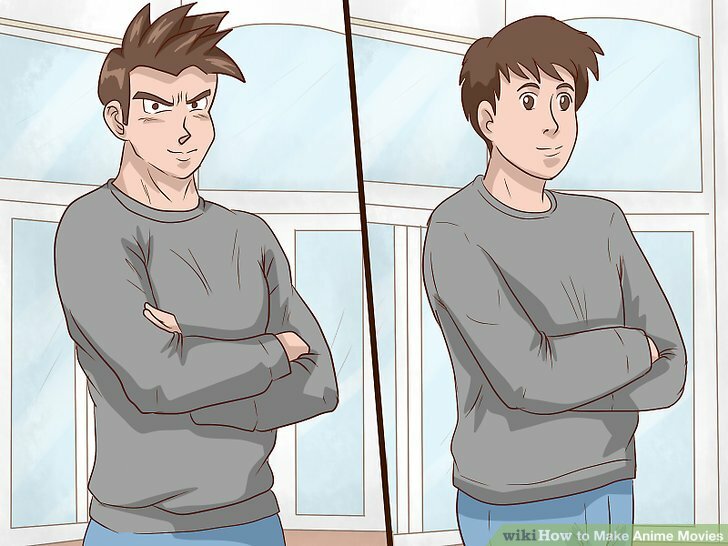 You may need to do multiple sketches before you get a character design you are happy with. Avoid settling for a character design that doesn’t mesh well with your movie’s concept and art style. 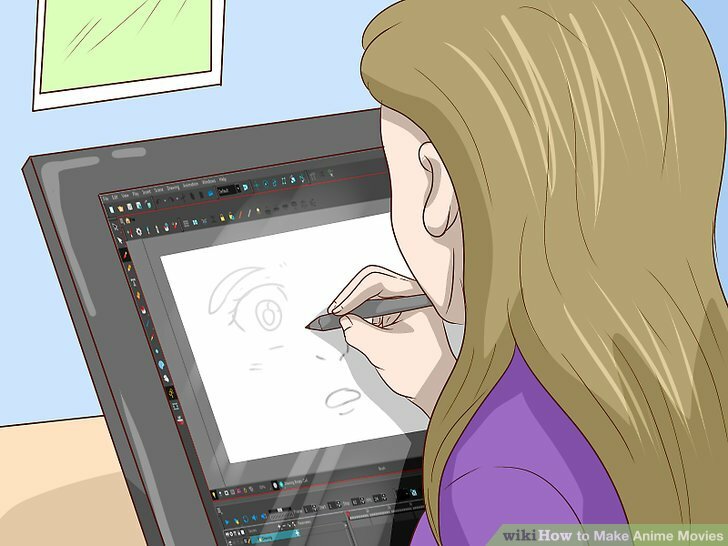 For computer art, try a program such as Photoshop or Clip Studio Paint. Make model sheets to show characters in various poses. Model sheets are basically character blueprints. Each character gets their own model sheet where they are drawn in various ways. They are also drawn with different expressions to finalize their designs and make them consistent no matter where the movie’s plot takes them. 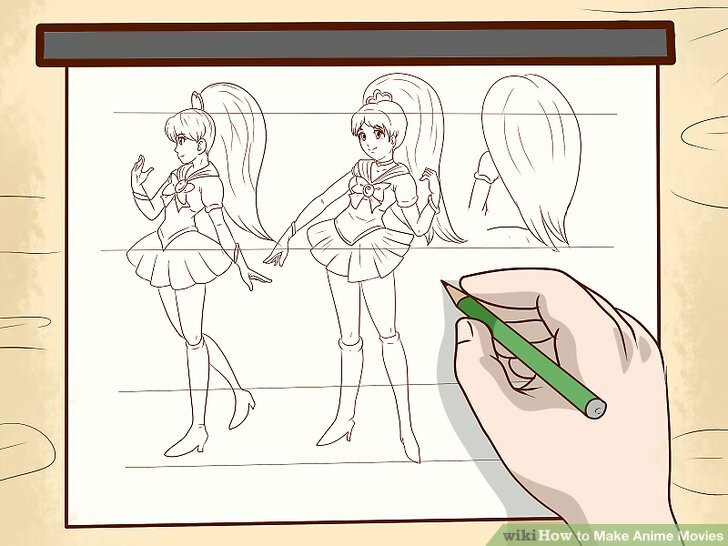 For example, draw your characters from the front, back, and sides. Draw them with a smile, a frown, a look of concern, and confusion. Storyboard your script by drawing out each scene. Storyboarding is like making comic strips for your movie. You sketch out the scenes in your script, each scene being a separate panel. 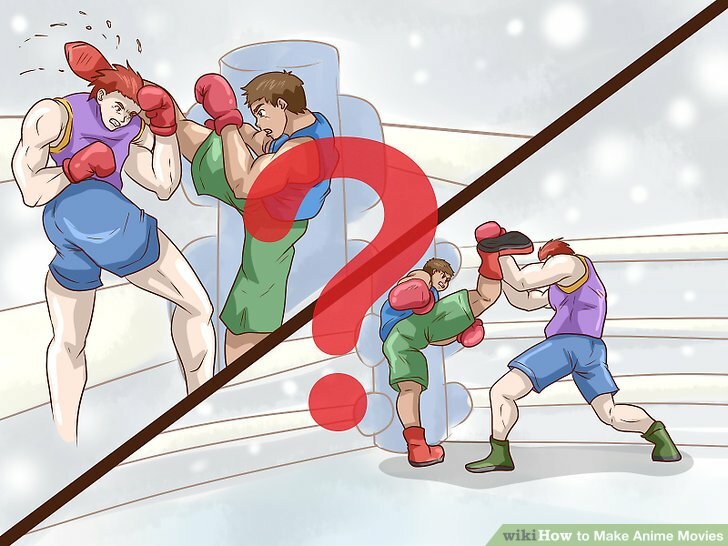 Below the panel, write a caption describing what happens in it, including directions like camera movements. 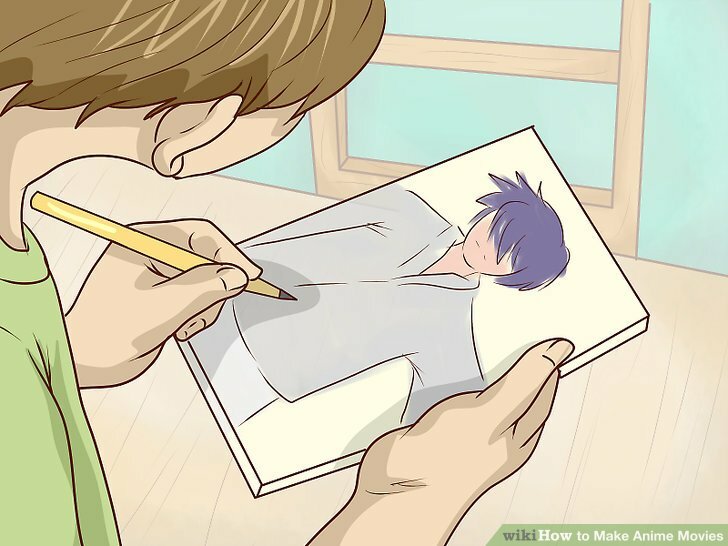 You can make your storyboard with paper and pencil or a computer art program. Storyboarding is a useful way to lay out the script’s plot, finalize the story, and begin converting it to visual media. Your sketches do not have to be fully detailed, but make sure you have a clear representation of each scene. Black and white sketches are fine. Draw the background locations and costumes. Layouts are preliminary sketches establishing where the movie takes place. These drawings can be kept black and white but need to provide a good idea of the environments your characters will visit. To fully realize these environments, try to make them as detailed as possible. Backgrounds affect your characters, their designs, and their personalities. They can almost be treated as characters in their own right! Costumes are included in layouts because they are important details for background characters. For main characters, costumes are part of their designs you sketched out earlier. For example, a train in a desert can be an important setting for a western anime. Fantasy animes often have colorful backgrounds with castles, while cyberpunk animes have towering cities. Stage the scenes by putting your characters in them. Staging involves figuring out where your characters will appear in all of your scenes. Arrange all of your background sketches in chronological order, then mark where your characters will be. Try to imagine where they will go as they move through the scene. You may need to make more sketches, such as a closeup of an alley your characters stumble upon. Use staging to flesh out your backgrounds and settle upon their final designs. 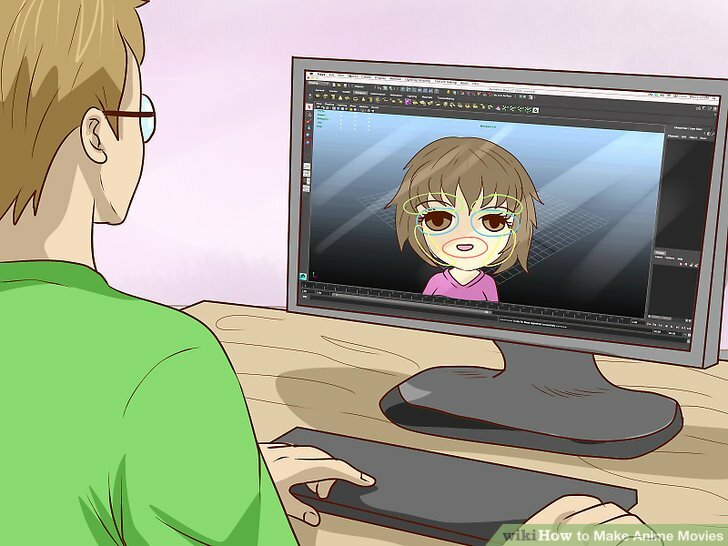 Choose a computer animation program. 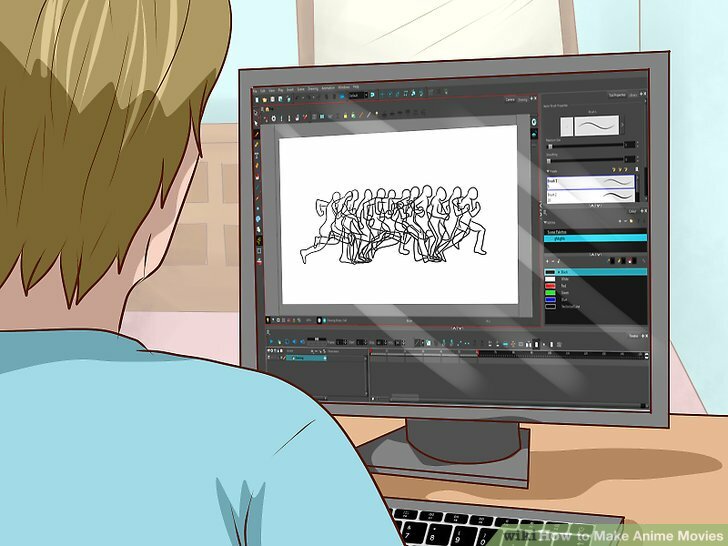 Animation work is done by stringing together scenes and character movements in a program. To do this, you need a program that is both easy to use and comprehensive. You can choose between 2D and 3D programs which will give you lots of tools to customize your own movie. For 3D work, try a program such as Blender. 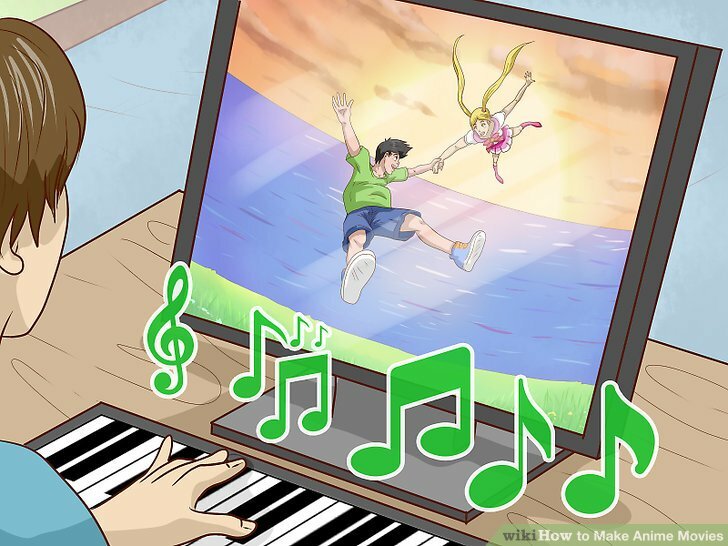 For 2D animation, choose a program like Animaker, Moho, or Pencil2D. Before computers, animation cells were hand-drawn. You can still do this, but drawing each scene takes a lot of time, especially if you work alone. Make mock-ups of complex and difficult scenes first. The toughest scenes take the most amount of work to get right, so most animators start there. 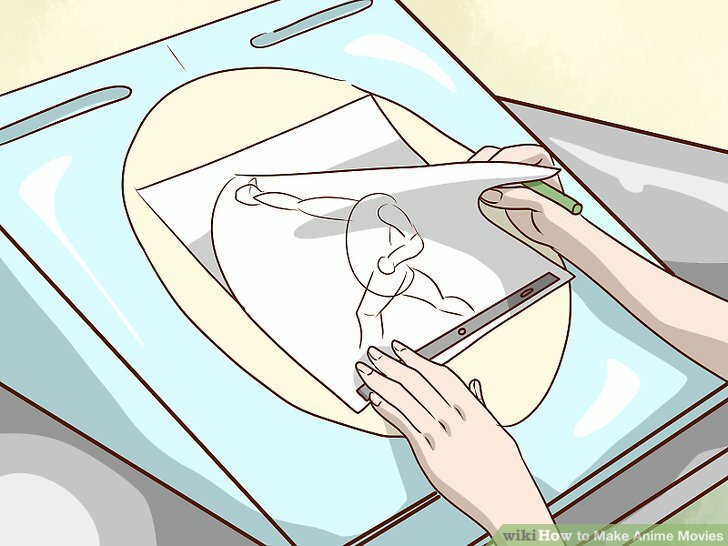 If you drew your scenes by hand, you can redraw them in a graphics program or upload them with a document scanner. Add your characters into the scene to use it as a point of reference. Mock-ups, or animatics, help you plan out how a tough scene will look. Use it to determine where you will put in visual effects like lights and shadows as well as other details. You don’t need to animate these scenes yet. Mock-ups are mostly for staging purposes. Model your characters in an art program. You finally get a chance to bring your characters to life. The goal of modeling is to draw a functional version of each character and scene. It is like building the basic skeleton for everything that will appear in your movie. You do not need to add intricate details like every wisp of hair yet. Arranging your models into a 3D version of your storyboard may help you imagine the characters in your movie. Rig your characters by giving them movement. If modeling gives your characters bones, rigging gives them muscles. To make movement realistic, you need to know where the joints are, like the knees, hips, elbows, and shoulders on a person. Use your animation program to give each character their proper range of motion. Remember to give mechanical objects realistic movement too! Even if they aren’t alive, they need to look convincing. 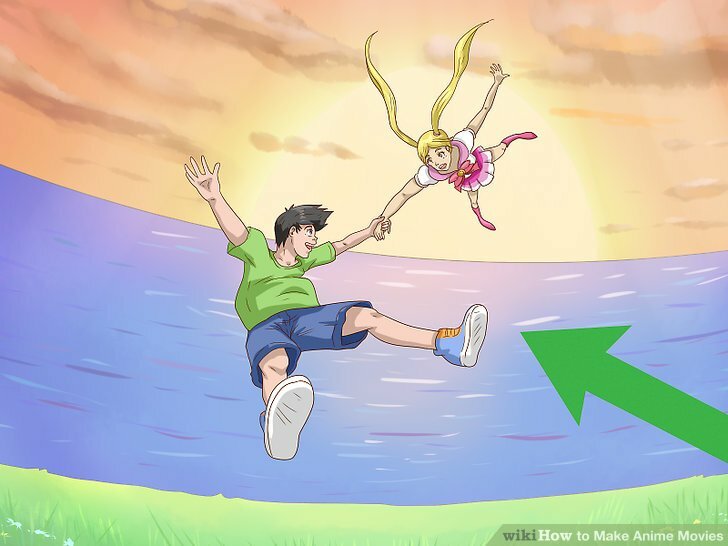 With anime, you can often exaggerate movements. Think of how exaggerated some hero poses are or how low eyes and mouths drop in shock. Color and add textures to your models. Begin adding details to your characters and backgrounds to improve their visual quality. 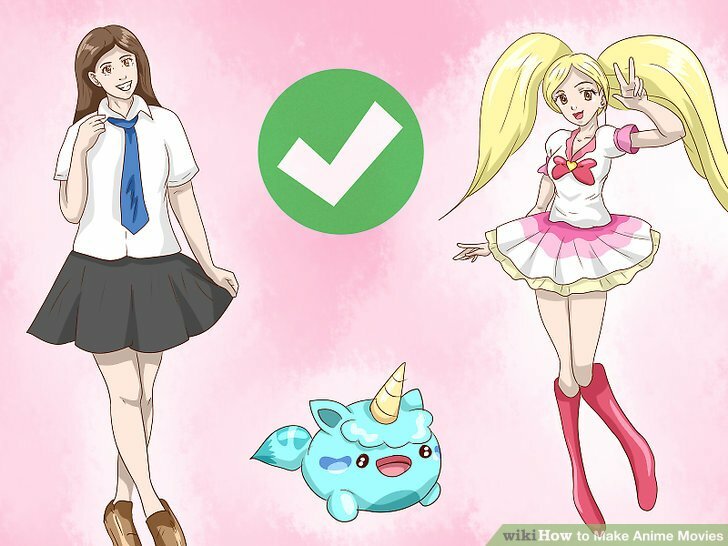 Color in your character’s hair color, outfit, and other details. Also add color to the world around them, including small details like the lines in wood or rust stains on metal. This can be a slow process, but the movie world will look so much livelier when you’re done! You may notice that some of your models don’t look right. This is a common part of the editing process. When flaws appear, go back to the modeling stage and fix them. Place light sources in your scenes. Arranging the lighting is tricky since you need to be aware of everything in the scene. A nearby window, candle, or another light source illuminates an area. The light needs to come into the scene in a realistic way and seem believable to the audience. You also need to draw in shadows, such as behind characters when light strikes them from the front. Light has an effect on the mood of a scene. A scene with low light can seem romantic, like a dinner date, or it can feel scary, like in a dingy prison. Aim for lighting that sets the proper tone. Materials can determine how light interacts. A reflective surface like a mirror may appear harsh, bright, and blinding, for instance. If you are unsure how to light up a scene, try replicating it in real life. Study the way sunlight comes in through a window, then incorporate your observations into your work. Animate your art frame by frame to turn it into a movie. After getting all the artwork done, you need to connect scenes together into a cohesive whole. This is done putting your characters and their world into motion. During each cell of animation, characters and other aspects of the world move slightly. Connect a bunch of movements together and you will have action in your movie! You can create motion by arranging your scenes in subsequent order and hitting the play ****on in your animation program. Think of a flipbook. If you flip the pages quickly, you create the illusion of motion from page to page. Making an anime movie is similar. Download a sound program to make sounds. Any good sound editing program allows you to both record new sounds and import pre-existing sounds. You will need the sound editing program for tasks like changing the volume and the length of sound files. Open the sound files into your animation program to add them to your movie. 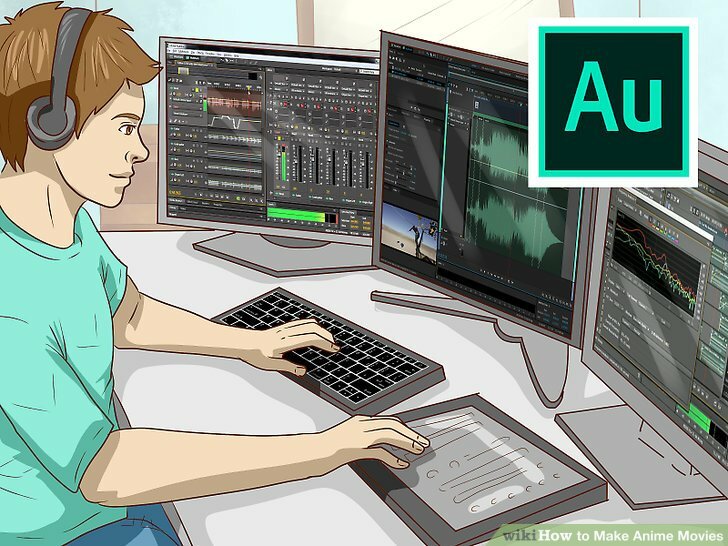 Purchase a program such as Adobe Audition or make use of a free program like Audacity. Record voice-overs for your character dialogue. Someone needs to read the script you painstakingly wrote. 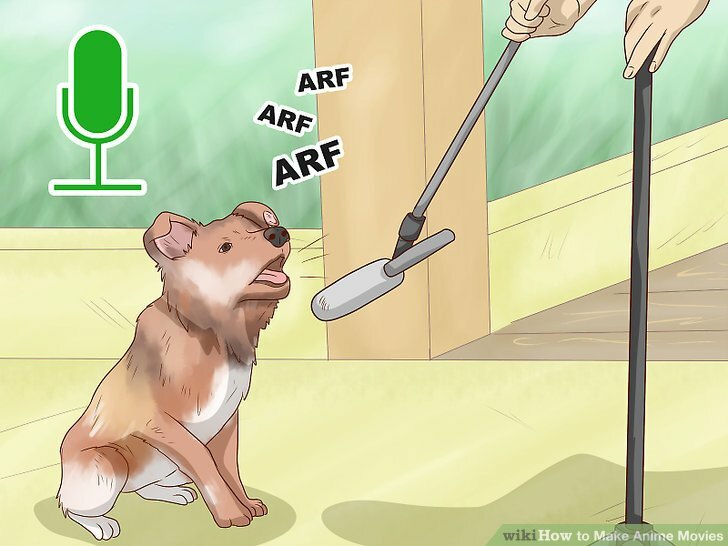 Choose a good voice actor for each character and record their voices with a microphone. Load the clips into an audio program on your computer, then listen to them to see how good they sound. Good dialogue sounds fluid and passionate. The voice actors should speak like you imagine the characters would sound. Make the dialogue believable. Expect to record portions of the dialogue multiple times. Getting it to sound right is worth it. Edit the dialogue into your movie. Match the dialogue clips to the scenes they belong in. You will need to work slowly, making sure each line syncs with the animation. If the characters open their mouths when they aren’t supposed to, your movie won’t feel immersive. You may need to go back and reanimate some portions to make them fit the dialogue. Add sound effects to your movie. Sounds like dogs barking, birds chirping, and trash cans rattling all add depth and atmosphere to scenes. You can usually find most of these sounds in royalty-free libraries online. However, if you want unique sounds, consider recording them yourself. For instance, if your movie has a scene with a car driving away from the character, recreate the scene. You can have someone else drive the car away from you as you capture it with a sound recorder. You may be able to make custom sounds. Use your voice or a computer program to create sounds without having to record them. Fill empty scenes with background music as needed. If you need to add more sound to your movie, get royalty-free background music or make your own in a sound editing program. 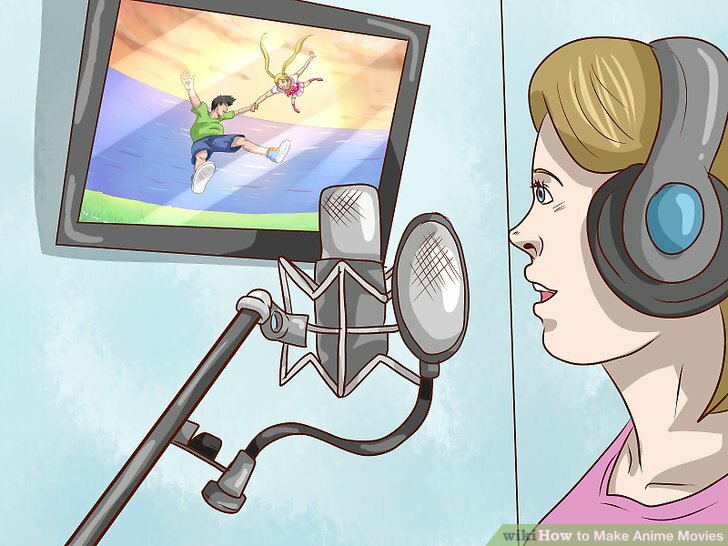 Background music can be used at any time, but you have to be careful with the sound mixing. 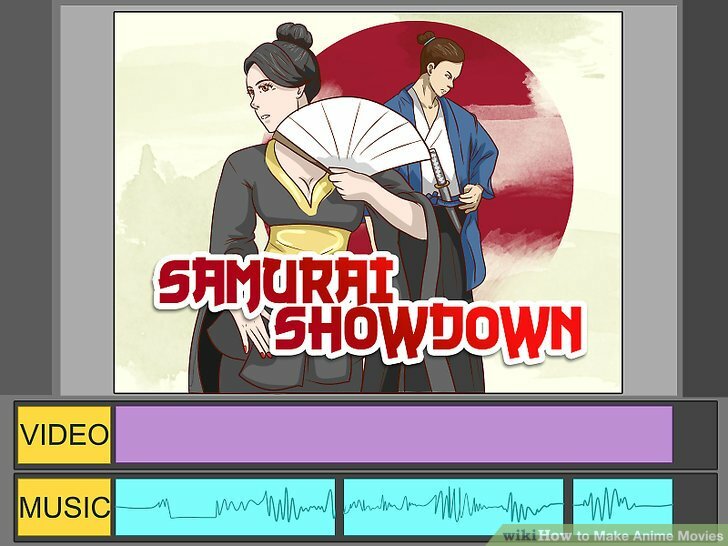 Edit the audio levels so the music does not overwhelm dialogue and sound effects. Music can be used to start and end your movie. A soaring tune can be good for a sweeping shot of a landscape, for instance. 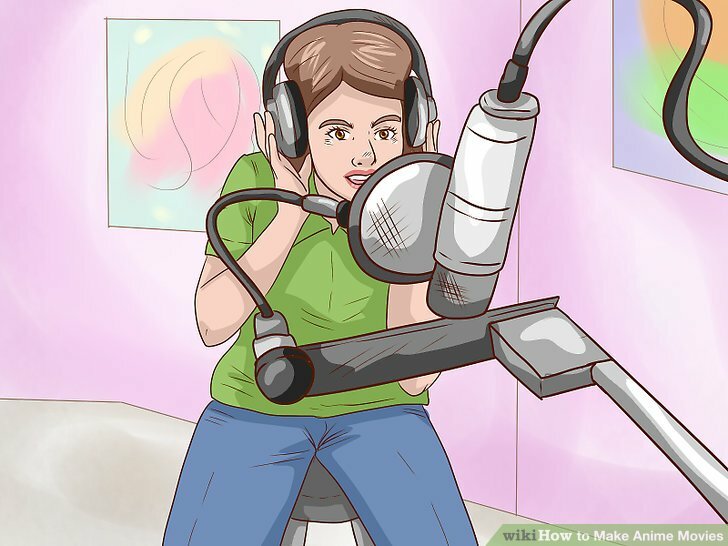 Monitor sound levels carefully. You can put music behind dialogue, such as by setting the music at a low level the audience can faintly hear as characters speak. Keep in mind ways that music affects atmosphere. A cheerful tune has a different feel than a mournful dirge, especially when you place it in a dark, violent scene. Finalize the music for the title sequences and end credits. Before publishing your movie, bookend them with intro and outro scenes. Your music choice is very important here since it starts and ends your movie. Create the scenes, type in the movie title or production credits, then give them music befitting the events of your movie. Title screens are often worked into the first scenes of the movie so they feel more natural and engaging. End credit scenes are often black backgrounds with overlaid text and music. If you want, you can add art or animation, but keep it simple so everyone can see who made the movie! Creating a movie is an individual process. Your process, or “pipeline,” may look different from someone else’s. Doing things out of order is okay. Work with other people. Professional movies have many people working different roles, such as an animator, lighting specialist, director, and modeler. Getting a good movie requires preparation. You need to draft your script and characters before you can make them a significant part of your movie. 20 movies every guy MUST see!